When a consumer files a complaint about a contractor's work, CSLB often calls on industry experts (IEs) to perform an inspection and render an unbiased professional opinion about whether industry standards were met, plans and specifications were followed, and contract terms and agreements satisfied. IEs regularly testify in arbitration proceedings, criminal hearings, and administrative hearings. Because IE testimony often is crucial to support charges of criminal and/or administrative violations, participating contractors must possess effective written and verbal skills in addition to their knowledge of industry and code standards. 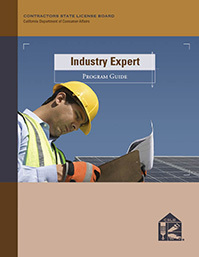 IEs must have held a contractor license for at least five years; it must be current and free of unresolved licensing and enforcement actions; and the IEs must be knowledgeable about up-to-date, accepted trade standards in their areas of expertise. CSLB IEs are financially compensated for their service. Learn more on CSLB's website or by contacting CSLB's IE coordinator.